Disclaimer: TUT touched on this in the Open Forum on Friday, but technically I was on vacation, and have been plotting this post for a week with no time to get it done. So basically I'm doing this anyway. Sorry TUT! I read somewhere, a few years ago, that most female gamers pick male avatars in video games and most males pick females. This left me really perplexed. "Why?" you may ask. Because in video games, I am always the girl. Of course, in the first games I played there wasn't an option to be a female character. You were Mario or Luigi. You were umm...well, let's just say the days of guys only didn't last too long. In 1988, came Super Mario Bros. 2, and with it began my long history of playing as girls. 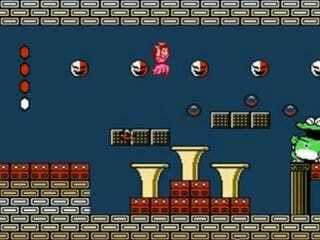 Not only did SMB2 give you the chance to play as Princess Toadstool, but it was almost beneficial to do so. I can't tell you how many times that float move of hers saved me from certain death. And it was nice to see that the Princess didn't always need saving: that she could stand up for herself, and take care of herself. My next game with multiple protagonists was this little gem: Maniac Mansion. I always had Razor in my party. (There she is with red hair and spiked collar...she was so cool.) I wouldn't let anyone else explode the hamster in the microwave but her. I've mentioned my Street Fighter 2 love a few places. My character of choice: Chun-Li. And usually, if my sister and I were playing, we would both end up being her. Feet rendered in blurs and flying across the screen, we would try to destroy each other, but really just ended up forgetting which one was in which outfit. We only realized who was who when one of us won, and more often than not both of us surprised at the victor. My sister and I grew up idolizing my aunt, who is a karate master. It was only natural that once Street Fighter came along, we would pick someone who reminded us of her: not in looks, but in ability. It was like we were being her in some small way. What's not to like about powerful women, with magical powers, who shoot things? I always had a love of magic growing up. Sure, it's not real, but that didn't stop me from wishing it was. And I always wanted to be this powerful, independent person. And I always wanted to shoot things. OK, well, that one's a stretch, but who wouldn't want to be Lilith or Maya? OK, well, that one may be a stretch too. All these women I could identify with. All of them had traits that I wanted or shared. And that's what made them so easy for me to choose. Sometimes I have trouble with male protagonists and their thought process, but females...I just get where they are coming from. So what about you? How do you play? And after you're done talking about what gender you prefer, head over to TAYClassic and write something. Anything. We'll read it. I promise!